The cofounder of Good Magazine was sitting on an airplane, about to fly home to Los Angeles, when a text message flashed across his screen: His house was on fire. By the time he landed, the fire had been put out, but not before it damaged the Echo Park home beyond repair. 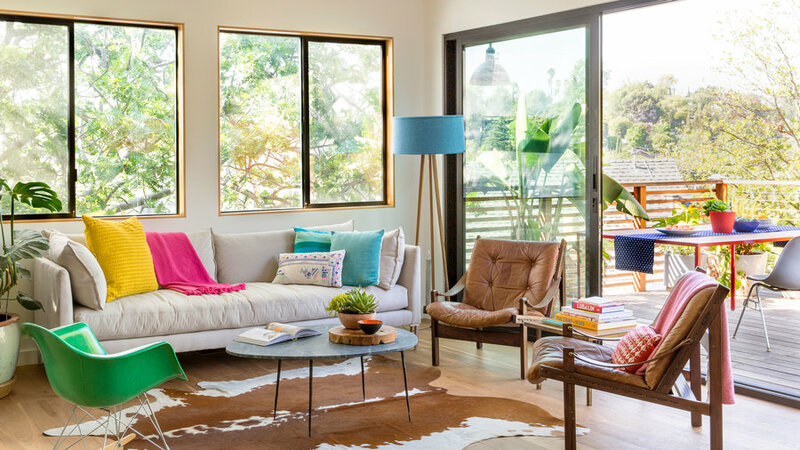 Instead of walking away from the shell of a property, Casey Caplowe saw it as the perfect opportunity to redesign his home. The catch? He wasn’t a trained architect. But that didn’t stop him from drawing up plans on scratch paper, checking them with architect friends, and then creating 3-D models. 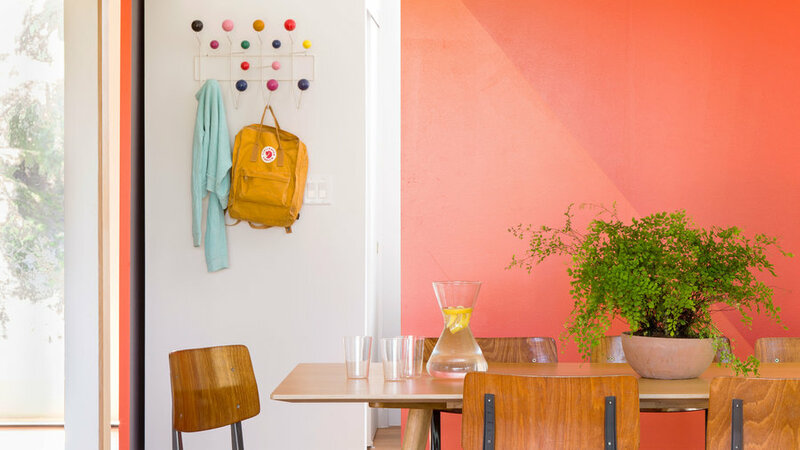 Check out Caplowe’s colorful new home, along with his top tips on taking your home from drawings to reality. After the fire, Caplowe expanded his 864-square-foot bungalow to 1,296 by adding a floor (for the master bedroom) to the original plan. 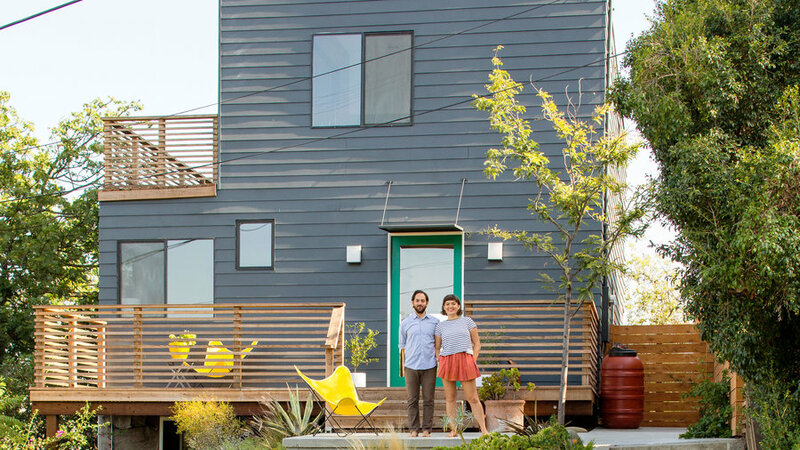 The slanted roof hints at his and Ellen Bennett’s love for angular shapes, which continue inside, while Hardie lap siding painted navy blue gives the home a classic California feel. The terraced yard is planted with resilient natives. 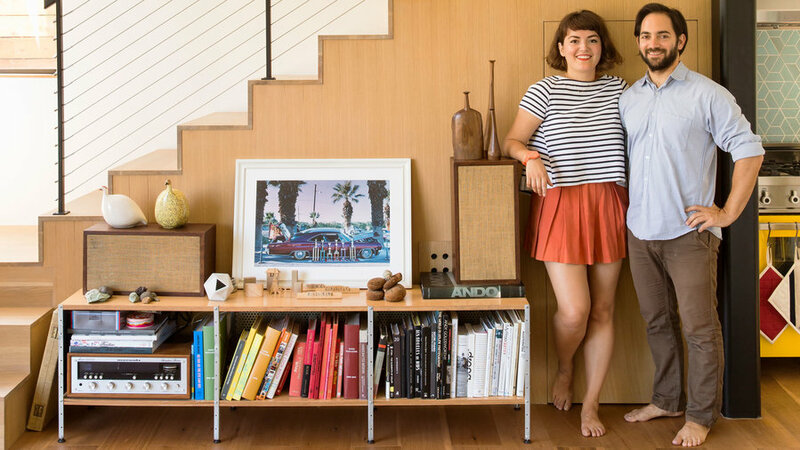 Caplowe was tarping what was left of his roof and soaking in the rolling hills of Echo Park when he had a lightbulb moment: He wanted to design his house around the views. From there, he was able to decide where the windows would go and how the house would flow. 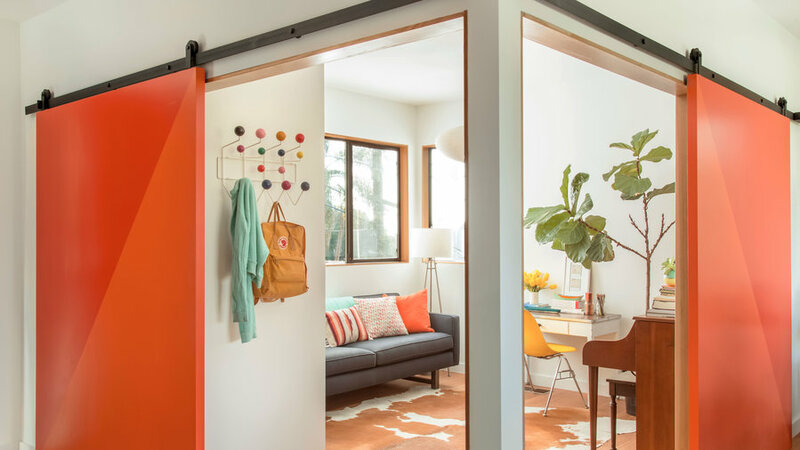 Coral and peach triangles adorn these doors that slide on a barn-door track. 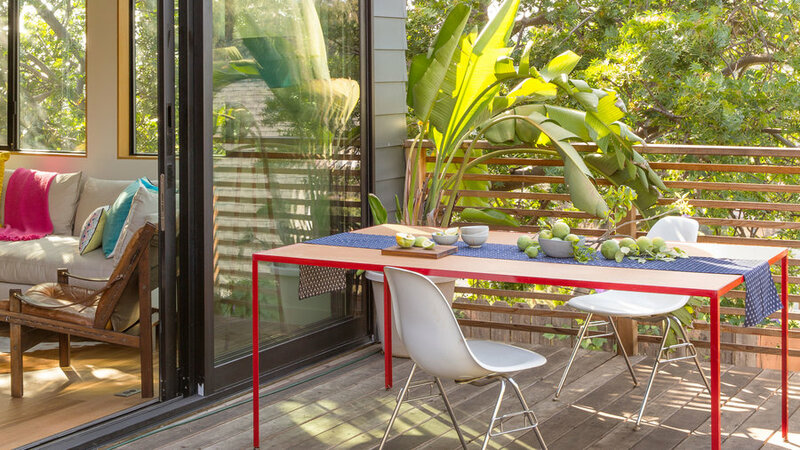 They open up to reveal a thrifted patio, fiddle-leaf fig free, and yellow Eames chair in a room that serves as a den, office, and guest room. Admit you can’t do it all and hire experts to fill the gaps. Caplowe credits his draftsman for refining his plans and streamlining the permit process. Real estate agents are usually in the know and happy to give recommendations for contractors, Caplowe says. Another method: When you happen to find properties you love, trace the work back to its contractor. Most homeowners are eager to divulge this information. 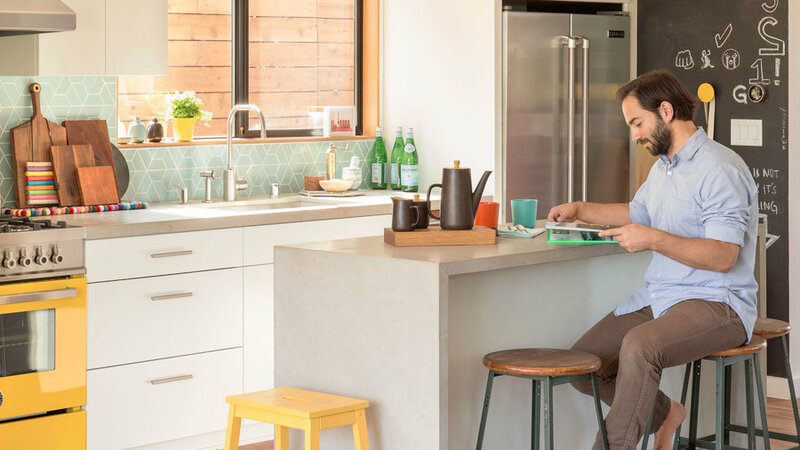 The main attraction in the kitchen is the bright yellow stove, which the couple decided to buy during one of their first appliance-shopping dates. They chose a soothing blue Heath backsplash to complement the yellow and added a chalkboard for their “absurd lists of grocery items,” says Bennett. To save space, Caplowe designed their kitchen pantry to fit underneath the staircase, which is wrapped in solid oak. Caplowe used for inspiration and for organization, creating different boards for each room in the house. He looked for themes among his pinned items and used those to inform his decisions. 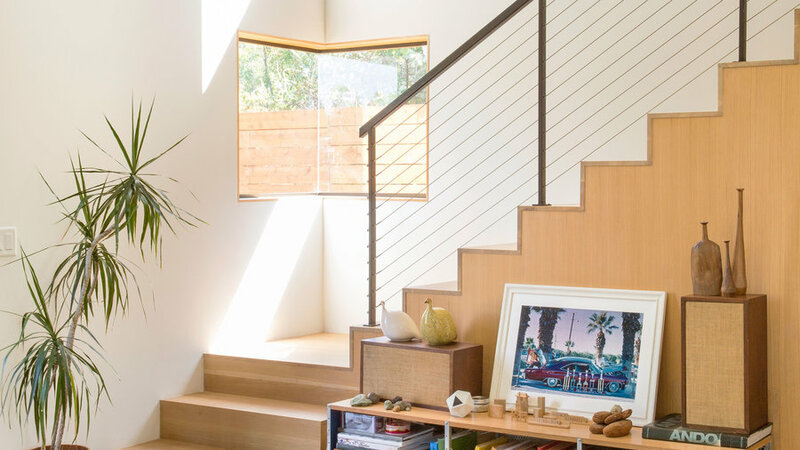 Caplowe realized that he’d subconsciously pinned rooms with wooden trim, for example, so decided to run with that in his own space. Bennett and Caplowe’s yard includes a bocce court and chicken coup. They also have three decks, totaling almost 500 square feet. The one outside their colorful, sunbathed living room gets the most use. “It’s really like one giant room,” says Bennett.